This document is the result of a series of lecture notes prepared by the author and utilized at different workshops and training activities organized by the FAO/DANIDA Project on Training on Fish Technology and Quality Control (GCP/INT/391/DEN) since 1986. Such activities, carried out in Africa, Asia, Latin America and the Caribbean provided an excellent opportunity to improve the text according to practical experience obtained in the field. The author has also utilized part of the material presented as lecture notes at the Technological University, Lyngby, Denmark, at the Royal Veterinary and Agricultural University, Copenhagen, and at the Alborg University, Alborg, Denmark. FAO has decided to publish it as an FAO Fisheries Technical Paper rather than as a project publication, to allow for a widespread diffusion in view of the worldwide relevance of the subject discussed. The present document was originally prepared for use at courses on assurance of seafood quality conducted for trainees with a basic knowledge of food microbiology or biochemistry. However, for people with practical experience working on quality assurance in the fish industry the document provides the necessary background information and guidelines for their daily work. 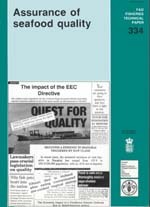 Many people have provided constructive criticisms, useful suggestions and contributions, in particular Dr Susanne KnΦchel and Professor Mogens Jakobsen, both at the Royal Veterinary and Agricultural University, Copenhagen, who have contributed with section 6.1 and sections 5.2 and 6.2 respectively. The document was produced and edited by Mr H. Lupin (FAO/FIIU, Project Manager of GCP/INT/391/DEN). The bibliographical references have been presented as submitted by the author. FAO Fisheries Technical Paper. No. 334. Rome, FAO. 1993. 169p. This document is primarily focused on the application of the Hazard Analysis Critical Control Point (HACCP) system to the fish industry. The document reviews in detail the potential hazards related to public health and spoilage related to fish and fish products, and discuss the utilization of HACCP in different type of fish industries. It contains a chapter making clear the limitations of classical fish inspection and quality control methods based solely on the analysis of final samples. A brief introduction about the relationship between the HACCP system and the ISO 9000 series is also included. The document is completed with chapters related to cleaning and sanitation and establishments for seafood processing, primarily seen from the HACCP point of view.. The author is indebted to a great number of colleagues, FAO/DANIDA workshop participants and students, who have given constructive criticism and useful comments of early drafts.. Particular thanks are due to Dr. Lone Gram, senior researcher, at the Technological Laboratory, Danish Ministry of Fisheries, which enthusiasm, untiring effort and affection to detail and quality of work has been a great stimulation and drive to complete this document..
Special thanks are given To Dr. Susanne KnΦchel, senior researcher and Professor Mogens Jakobsen, both at the Royal Veterinary and Agricultural University, Copenhagen. Their contribution of sections within their special expertise is greatly appreciated..
Mr. Karim Ben Embarek and Ms. Bettina Spanggaard, both Ph.D. students, have been both helpful in reading proofs of manuscripts and preparing index. Finally special recognition is given to Maria Henk and Inge Andersen of the Technological Laboratory, Danish Ministry of Fisheries, for skilful secretarial assistance in the preparation of the document.. The Food and Agricultural Organization of the United Nations (FAO) has always recognized the need for quality assurance as an essential discipline to guarantee safe, wholesome and functional fisheries products. No food production, processing, distribution company or organization can be self-sustained in the medium and long term unless the issues of quality, including the safety aspect, are properly recognized and addressed, and an appropriate quality system is put into operation in the processing establishment. The practical limitations of classic methodologies of fish inspection and quality control, based on analysis of final samples, have been known for several years. This is why many Governments and the fishery industry in developed and developing countries have embarked on an important conceptual change of fish related regulations, including inspection, handling and processing, import-export and marketing. The need for effective quality assurance systems is further underlined by the fact that global fish production has reached a plateau and that further increases in wild fish catches cannot be expected. Improved utilization of present harvest is therefore an important requisite for maintaining the contribution of fisheries to valuable food supplies. This document is primarily focused on the Hazard Analysis Critical Control Point (HACCP) system which is at present recognized as the best system for assuring safety and sensory quality of food products. Additionally, the HACCP system is aimed at reducing the failure costs in the fishery industry, including the reduction of post-harvest losses. The HACCP system is at the basis of the new regulations on fish inspection adopted by the European Economic Community (EEC), USA, Canada and a number of developing countries. Such new regulations are very often characterized as “HACCP-based systems”. FAO attaches great importance to training, and since 1986 the Fish Utilization and Marketing Service through different projects, in particular the FAO/DANIDA Training Project on Fish Technology and Quality Control, has provided training on HACCP to more than 2 500 fish technologists in developing countries. As impressive as this may appear, a lot of work must still be done to cover the present needs of developing countries in this field. We hope that this publication will contribute to this need.